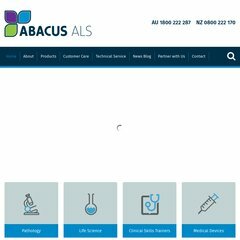 Abacus-als is ranked 2,972,612 in the United States. Topics: Clinical Users, Research Users, Sherlock Mouse, and Research Suppliers. On average 2.00 pages are viewed each, by the estimated 37 daily visitors. There are 2 Nameservers, brigh.twoplums.com.au, and mutley.twoplums.com.au. It is hosted by Net Logistics Pty. Ltd (New South Wales, Sydney,) using Microsoft-IIS/6 web server. It is written for ASP.NET language. PING www. (122.201.89.117) 56(84) bytes of data. A ping speed test response, is timed at 193 ms.